Expert diesel repair and regular maintenance is critical to the performance and longevity of your diesel. Our experienced and highly skilled technicians can help you keep your truck running efficiently and smoothly for many miles into the future. Diesel engines run at about double the compression rate of a gasoline engine, and generate more heat and work harder. The diesel system is very efficient and offers plenty of power and up to 40% greater fuel efficiency. However, there is a price that comes with generating that much power. The heat that’s generated places high demands on the engine’s lubrication and cooling systems. A breakdown in those systems may mean breaking down on the road and having to take your vehicle into the shop for expensive repairs. Fortunately, many of these problems may be prevented by having maintenance performed on a regular basis. It always comes down to the fundamentals. The filter and engine oil should be changed according to a regular schedule. Some people change engine oil after 300 driving hours or every five thousand miles depending on specific driving conditions. We recommend synthetic motor oil because it’s much less prone to breakdown and gives better protection to critical engine parts. The most important thing no matter is, whatever your schedule is to change oil, stick with it. It is among the least expensive ways to extend the life of your engine. Just like athletes during their strenuous workouts, diesel engines need to have plenty of air to keep it running at full power and efficiency. To ensure that the huge amount of air continues to flow, the air filter should be checked every five thousand miles or even sooner, if you drive in dusty condition. Having a clogged air filter would be like choking the life from a diesel. Also, a clean air filter prevents contaminants from getting into the engine. A diesel engine, of course, needs a steady supply of clean fuel maximum power. In order to keep the fuel flowing, clean fuel filters are a necessity. You should make sure your primary fuel filter and secondary fuel filters are either cleaned or replaced,, based on the manufacturer’s recommendation. Diesel fuel can become contaminates with water and wax, and those impurities can wreak havoc on fuel filters and, ultimately, engine performance and reliability. Keeping your engine’s cooling system properly maintained is at the core of keeping a diesel in good condition. Although these tough engines can handle tough conditions, overheating is something that diesels don’t handle very well. Whenever a diesel overheats, it can result in major repairs and big problems. Head gasket failures and head and engine block warping are just a few of the very expensive problems you can encounter with overheating a diesel. Some trucks come equipped with an audible alarm and a warning light on the dashboard in order to alert the driver that the engine is starting to exceed its regular operating temperature. Checking them on a regular basis to ensure they are in good working order is essential. Checking to ensure your coolant is clean and at the proper level. Engine coolant has a definite lifespan, and old coolant may damage engine components and can offer less efficient heat transfer and protection from freezing. Modern diesel trucks come equipped with a very good braking system that when maintained is very safe. On a truck, brakes are most likely the most important of all safety features. They generate huge amounts of heat each time a driver steps on the brake pedal to stop or slow the truck. It takes a toll on the brakes eventually and you need to replace them before they fail. It could be catastrophic for your brakes to fail at a crucial time. It is a top priority to make sure the brakes, pads, shoes, connections, hoses, and brake fluid are all in good shape. You also want to make sure you don’t ruin rotors and drums with metal-to-metal from excessively worn brake pads and shoes. Getting brakes checked every 5,000 miles could prevent the replacement of expensive rotors and drums – saving you a lot of money on brake repair too. Your truck’s steering and suspension systems are critical and should be regularly inspected and lubricated when required. 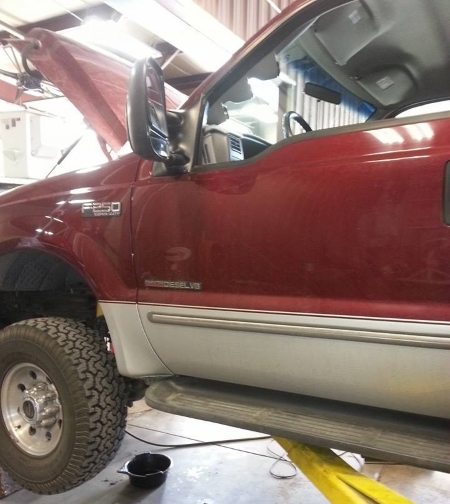 There are some trucks that require grease for all chassis, suspension, and steering components about every five to ten thousand miles and should be inspected regularly. Make critical sure bolts have not started to become loose and have the right torque. Constant vibration from the truck being on the road might cause the bolts to start to come loose, creating a catastrophe that could be avoided. Your truck works hard and often hauls a heavy load or a trailer. Keeping an eye on your suspension and steering systems can avoid a catastrophe and will contribute to a safer ride for all. Gradually over time, the diesel injector nozzles, as well as the piston and pump, if they come equipped with them, frequently accumulate a build up of varnish and carbon. Over time that will normally occur to engines after you have driven many miles. Also, if you happen to drive around town a lot with stop-and-go city driving it can create deposits a lot faster compared to highway driving. The build-ups may occur on any type of internal combustion engine, whether it uses diesel or gasoline. If your vehicle has a diesel engine, then you will need to have diesel injector servicing at some point. Ledom’s Performance Equipment And Diesel Repair is your Pikes Peak Region fuel infection expert. Your transmission and transfer case (if you have a 4-wheel-drive truck) are tough units designed to go thousands of miles virtually trouble-free. But they do require some maintenance like regular fluid changes and can eventually wear out and leave you stranded. Ledom’s can service and repair all brands and models of transmissions and transfer cases. We also carry the right lubricants for your transmission and transfer case. A turbo charger increases the efficiency and power of your diesel engine by forcing additional air into the combustion chamber. Vehicles equipped with a turbo can squeeze more power out of smaller, more fuel-efficient engines. If you are experiencing power loss, check engine light, excess smoke or loud whirring or grinding noises from your diesel engine, it might be time to service that turbo. Your truck’s exhaust system sure can take a beating. But most are built well from the factory and they last a long time. But, they do rust and can get damaged by road conditions and debris. Newer trucks may have emission control systems built into the exhaust system that need service and/or repair. Ledom’s can take care of your exhaust system needs. Call Now To Schedule Diesel Repair At Ledoms!